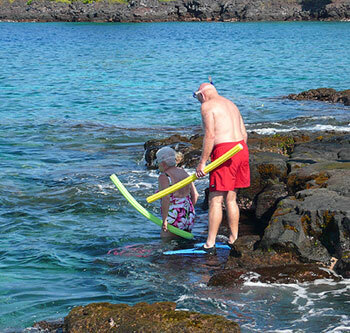 We were looking for instructions for exiting at Two Step Honaunau snorkeling spot on the Big Island. My husband & I are heading back to Kona soon. We aren't in great shape but had a great time snorkeling during our first trip. 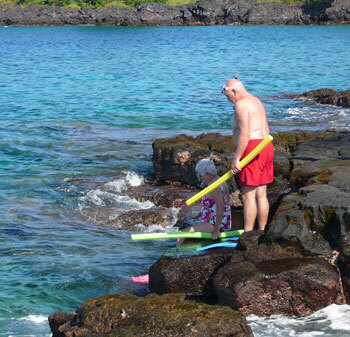 We were very comfortable in the water at Honaunau, and I don't think we would have much trouble entering at Two (Three?) Step. What I'm concerned about is exiting. We're decent enough swimmers but not super strong - I would have a hard time pulling myself out of a pool with no ladder, for example. Thoughts on exiting Two/Three Step? Thanks so much for all of the great info on your website! Kelly, you should be fine exiting at Two Steps. We have seen all types of bodies enter and exit at that spot. There is a trick to getting out that makes it easy. I edited some pictures to show you what to do. There are actually three steps. One of the steps is most often underwater. Look at the picture below. See the woman. Notice you can just see her pink fin on the lower step? Notice that the water level appears to be only that high? Now check out this picture that was moments later. She is now standing on that lower step. And now look at how high the water is. What you are seeing is ocean surge. And using that surge to exit is the trick to making it easy. Because yes, it is very difficult for anyone to try and pull themselves out of the water. But if you wait for the surge to come, and just rotate around and plop your bottom on that lower first step, it is easy. Just don't try it when there is a big wave coming, or you may get hurt. Also watch out for urchins in the holes in the rock on these steps. Dreamy Entry at Two Step! A couple of weeks ago I asked about the entry at Two Step. Galen posted some great photos and good advice. Game on! Getting in- AND OUT, which is what I was most concerned about- was no problem AT ALL! There was a lot of surge compared to the other two times we snorkeled there, but we got near the center, very safely, and saw the ALOHA spelled out on the bay floor. Still relatively new at this and it was a huge confidence builder all around! We did see a turtle, munching on grass in a small protected spot right at the rocks near entry. Also, even though we weren't able to get there until about 12:30, and street parking was full, there was a small dirt and gravel lot with a $3.00 price. Totally worth it! If you're feeling meek, go for it! Very happy I did and thanks for the encouragement and detailed instructions. A good friend even newer to snorkeling joined us and she was totally comfortable as well. Swim with the fishes! My husband and I just visited today and it was amazing. This place is so easy to get in and out of, it just isn't a concern. The fish are abundant, the coral just goes on and on at all different depths and we had the special treat of watching a sea turtle feed and then gracefully swim away. We will definitely return again and again. Some days it's pretty calm and safe for you, but there are days when the waves are bigger and it's not really safe. Especially in the winter. The EXACT same spot will be totally safe one day and treacherous the next. Just because you swam here yesterday, don't skip the step of watching the water for a while before deciding whether to get in. One time I was there in the early morning, and had the dolphins to myself. Later I was told to avoid early morning and dusk, as that's when sharks are around. One last thing - when exiting Two Step, use the surge to get to the first step, then QUICKLY turn and exit before the next wave comes. If you stay there, you might get slapped by a wave. Every time we have visited Two Steps it seems someone is having a hard time trying to enter the water off of the lava base. It is very dangerous to do so. They either have never heard of the Two Step entry point (very safe) or could not find it. The best way to describe how to find the Two Steps entry is from the parking lot walk out through the center of the lava beach to the water's edge. Facing the bay at the waters edge turn left and walk along the shoreline. As you are walking, the lava is on your left and the water is on your right. Keep walking (it is not far) and you will find the Two Steps water entry. You can't miss it and you will know when you are there. It is about an eight foot carved out indention in the lava. On both sides of the indention there is a step down of about one foot or so onto a smooth flat rock. You can sit on the edge or on one of the steps and put on your gear. You can then just sit on the flat rock and scoot forward about four feet and hang your feet over the edge and either roll over or lean forward into the water. The flat rock will either have no water on it or be covered with as much as a foot of water. You will be entering 6-8 feet of water and will instantly see a ton of fish around you. Guaranteed. Rough water exit back onto Two Step takes a little finesse. Common sense prevails.